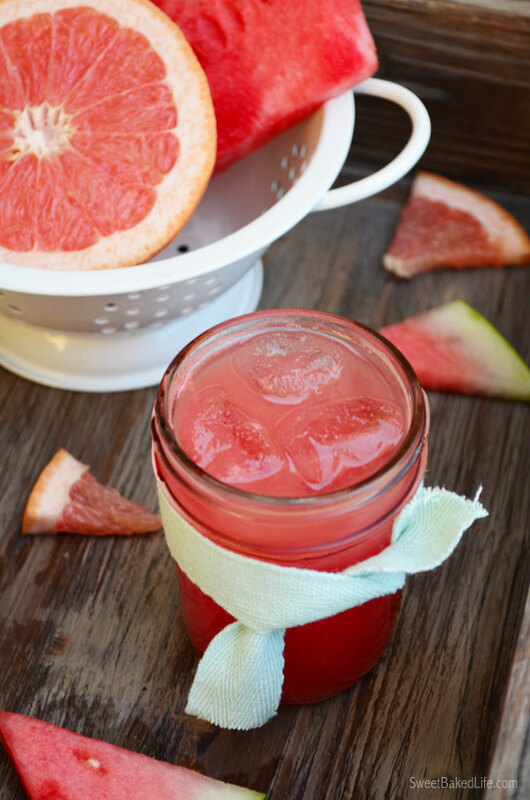 Unwind from the world or your crazy week with this refreshing Watermelon Grapefruit Margarita. What do you do with leftover watermelon? Easy. 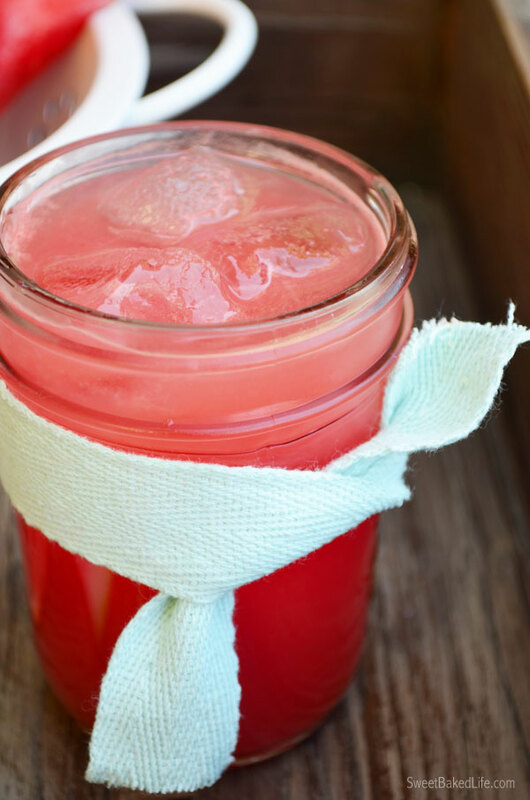 Toss it into your blender and make pure, delicious watermelon juice. What do you do with fresh ruby-red grapefruit hanging from your tree in the backyard? Easy. Juice the succulent fruit and use it in your favorite summertime recipes. Combine these two juices together and you get a unique and refreshing drink. Add a bit of tequila and you get a wonderful summertime cocktail. And that’s just what happened around here. You see, my teen son had a party last Friday night and he insisted on getting a large watermelon for me to slice up for the bunch. Happily I did, however mind you, that only a couple of slices were eaten — these kids were more interested in the candy, pretzels and pizza! Go figure! The next morning I was contemplating what I could do with all the leftover watermelon. I mean, we can only eat so much of the stuff. Then it came to me — make some kind of delicious drink. But not just a watermelon drink. I wanted something that had a special zing and freshness from citrus. 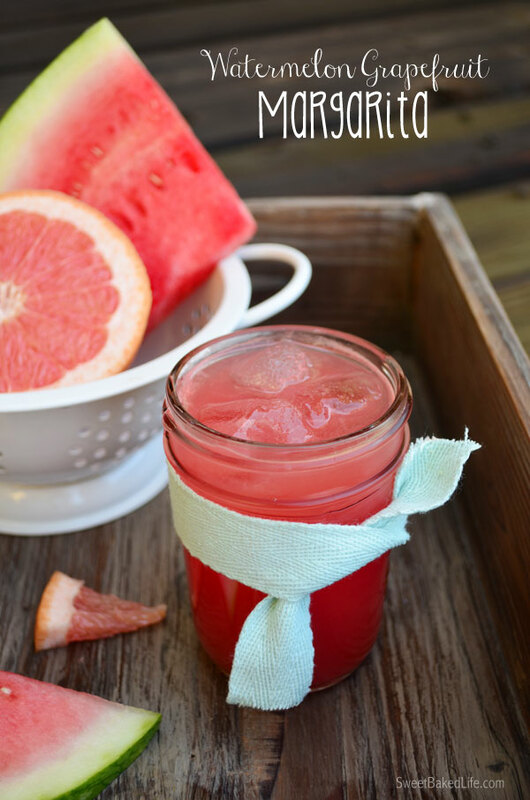 Ah, ha…I had it…I quickly picked a few large grapefruits from my tree, juiced them, chopped the watermelon and whirled it up in my blender, then added some fresh lime juice and agave nectar — delightful! The perfect afternoon refreshment. But then when the evening approached, I was craving an adult drink — so I poured tequila to the pretty juice and the rest is history! This Watermelon Grapefruit Margarita really hit the spot — my nerves slowly unwound from the long night of hosting a bunch of crazy teens for 5 hours; the loud music, dancing, swimming, movie watching, girls screeching, boys being boys, unending food, fireworks and the clean-up, all started to become a faded memory! Add watermelon juice, grapefruit juice, agave nectar and lime juice to a large cocktail shaker or measuring cup and stir. Fill 2 cocktail glasses with ice. Add 1 oz. of tequila to each of the glasses then pour the watermelon-grapefruit mixture to fill the glasses and stir well. 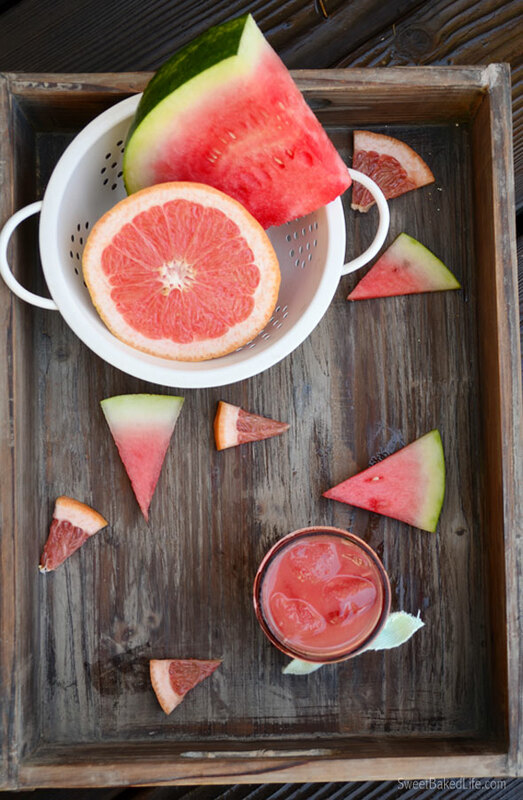 Garnish with fresh watermelon and grapefruit slices. *To make the watermelon juice. Cut seedless watermelon into 1-inch chunks. Place into blender and pulse until completely blended and liquid. Pour through a mesh strainer to remove any pulp. So, if you’re in need of some rest and relaxation, be sure to enjoy it while sipping on this cool and fresh Watermelon Grapefruit Margarita. Ha! So cute…your mom ^. This actually sounds like a great combo! I just had gin watermelon and basil over the 4th of July. I am going water skiing and I am into craft cocktails. This one sounds easy to make. Perfect for a boat ride! Thanks. Sounds wonderful to me! I could go for one of these poolside! Thanks for sharing it with us at #FoodieFriDIY!